When I started kindergarten it was still just half days. I went in the afternoon and shared a desk with the morning student. There was an imaginary line in our desks dividing our stuff. It was drilled into us by the teacher, a line to never be crossed. I had been fortunate that year to get the big box of crayons, but one day the box was missing. I searched through all my things, then made the risky move of checking the “other side”. Sure enough, there was my box of crayons in the “other’s” pencil box. I switched them back and this became my daily ritual… I suppose most students would have told the teacher, but I never remember talking with her. 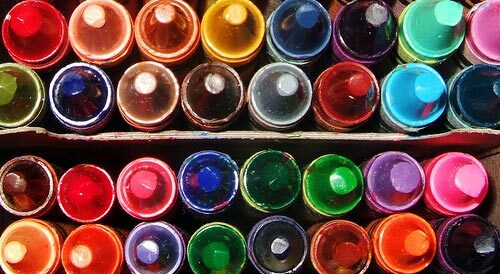 Just daily getting out my crayon box. And now Ivy heads down this road. The path toward those who will steal your crayons… so I am a little worried. This debate runs in every parent. Some choose to hold children back and others choose to home school. None of these choices are bad. But now that I am living this moment I suspect many of these decisions are based on us, the parent, as much as they are based on the child. We are the ones not ready to let go. But letting go is a part of life. Still, it is difficult. And I am not sure that I could do it, except that I do not let her go into the great unknown alone. After all, she is only my child for a season. A season of blessing and pride for me, but she is another’s for eternity. And He goes with her. Through the ups and downs, the twist and turns, He will be there. When she first realizes not everyone is kind. When others speak words of hate or lies. When she is left without any crayons. He will be there. Even when she is the one who has done wrong. When she is the one who gossips about another. When she cheats to get the work done… He will be there, watching over His child. We do not let her go alone. We could not. Instead we send her with our Father down the same path we traveled years earlier. The same path every generation travels. The details change, requirements supposedly advance, but each child moves out from under their parents. It is a path that teaches us so many things. Some colored brightly shades of joy and goodness, but alongside come dark shades of hate and reproach. Life varies far beyond our imagination. Thanks, Sean for the reminder about letting go. Truth. Hey Merry! You are in a much more intense place ~ isn’t Darcy a senior!!! Of course you are also in such a wonderful place because all three girls have proven themselves in so many challenges! All three pressing down the path of Christ!!! Isn’t it wonderful to have enough faith to know he’ll be there no mater what comes, for you and Megan and for Ivy? And little Phoebe too, she’ll be lonesome without big sister. Phoebe will be sad. I am not sure who will cry the most – her or Meg!